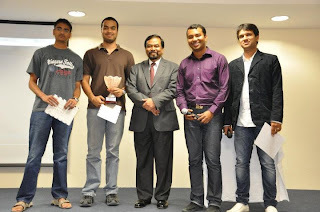 The Department of Media and Communications of Manipal University, Dubai organized the first Inter University Moviola Competition on Thursday 1st March 2012. The competition was hosted by the RJ Sid (aka Sidhharth Seth) of 89.1 FM. The competition commenced with the elimination round, which comprised of eleven teams from four universities. Each university had three teams during the elimination round, and from which the final six teams will be selected for the competition. The competition was divided into seven rounds; Warm up, Audio/Video, Connect it, Identify the crew, Pick and Guess me, Perceive Me Round and lastly the Rapid Fire round. Each round consisted of seven questions, including one for the audience. For those who were able to answer from the audience in each round were given a DVD each. Devdatt Maganty and Anirudh Raju- BITS Pilani Team, "The Usual Suspects" bagged the first place. The winners for the Moviola Competition were Devatt Maganty and Anirudh Raju from team ‘The Usual Suspects’ of BITS Pilani, Dubai. The 1st runners up were Bharat Mehrotra and Aakanksha Agarwal from team ‘Movie Maestros’ of Institute of Management Technology. The 2nd runners up were Sidharth Satheesh and Vishak Balakrishnan from team ‘Justice League’ of Manipal University, Dubai.